Begun with an unnumbered issue for 1921/22, it is published annually. 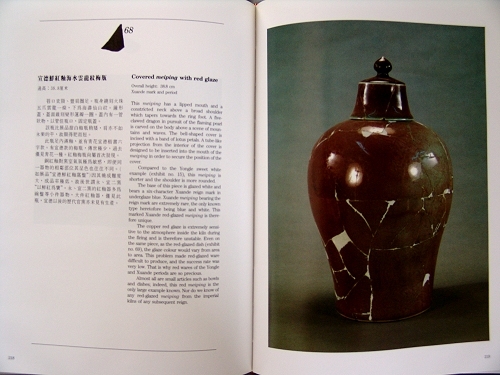 Many of the articles are studies on Chinese ceramics, but also on other aspects of Chinese and Asian art. 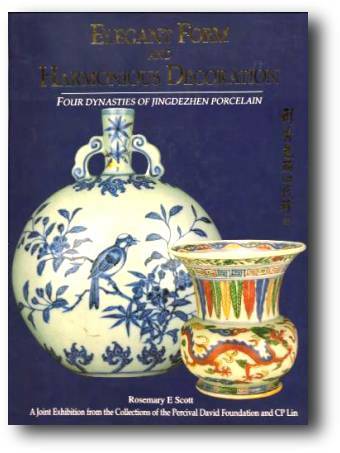 The entire series as well as individual issues are unequaled sources of scholarly discourse on Chinese ceramics. Highly recommended. Catalog of the anniversary exhibition at the Foundation, June-Sept. 1992. An excellent work illustrating objects from the Percival David Foundation and the private collection of Mr. C.P. Lin. Both collections predominantly contain fine Imperial wares and it is these porcelains that reflect the tastes and interests of the Chinese court. 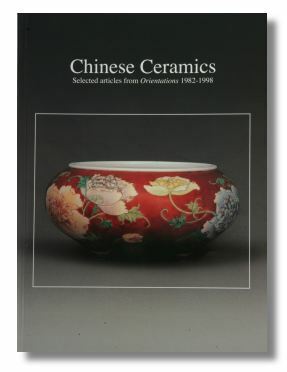 Percival David Foundation of Chinese Art: Colloquies on Art and Archaeology in Asia., London 1992. Hardcover: 175 pages, 200 objects depicted in color. By: Rosemary Scott et al. 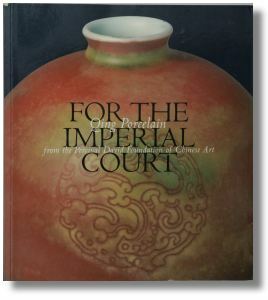 This is the catalogue to an exhibition organized by the Los Angeles County Museum of Art with pieces from the Percival David Foundation in London. Smitten by the riches of the Imperial Collection, connoisseur Sir Percival David (1892-1964) braved the “insuperable obstacles” posed by rival Chinese collectors – and the chicaneries of the Chinese bank which then owned the priceless porcelains in the collection – to purchase, in 1926, the collection, which is now quartered at the University of London. The 56 pieces that makes up this exhinbition date from the 9th to the 18th centuries. Formerly owned by Chinese emperors, they document fluctuating imperial taste and bear witness to an enduring high standard, from Jun ware from the 12th and 13th centuries – smudged generously with mottled plum and purple glazes – to the delicate naturalism of 18th-century Jingdezhen tea sets, painted with lotus blossoms. 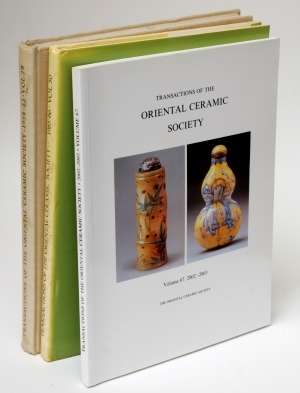 Rounding out the many color photographs and catalogue essay by curator Rosemary Scott are other pieces by Rosemary Scott and scholars George Kuwayama, Roderick Whitfield, Wu Tung and Denise Patry Leidy discussing archeological research, the origins of ceramic painting styles, the role played by such porcelains in Chinese painting itself and the influence of East-West trade on the art. 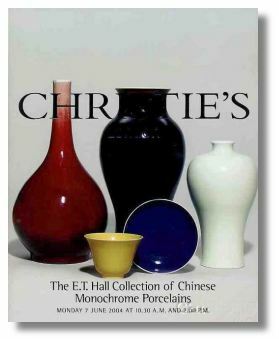 2004 Christie’s London The E.T. Hall Collection of Chinese Monochrome Porcelains 6/7/04. 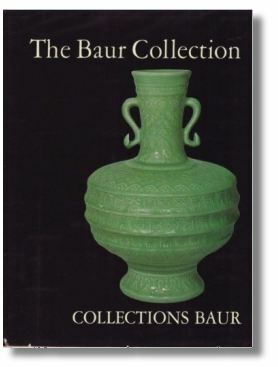 This post auction catalog consists of 251 pages with 286 lots mostly illustrated in color and all described in detail. This was the sale that finally put monochromes on the map! Some really terrific pieces. 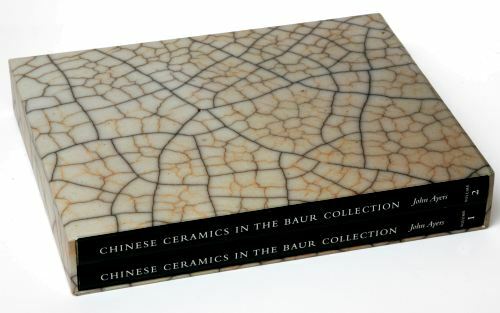 This book was published in conjunction with an exhibition of the same name. Most of the objects featured in this exhibition are are pre-eighteenth century. This collection also features many objects produced in the “guyue xuan” style, the only other notable collection of which is found in the National Museum of Taipei. The collection from which the exhibition is drawn and the quality of the text, makes this modest book a “classic” or “must have”. Comparably thin but a very important book. 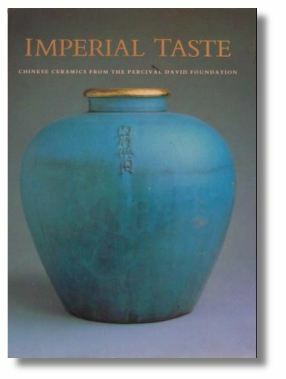 For those with a serious interest in Imperial Chinese porcelain. 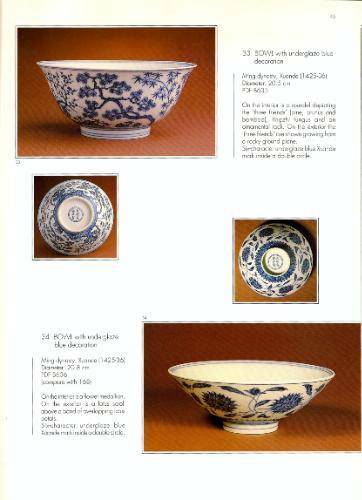 Drawing from examples of V & A collections, the study is a useful introduction to Qing ceramics, focusing on objects produced for domestic use. 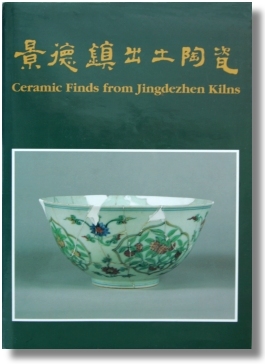 Has a very useful chapter on sources in Chinese, French and English on the history of Jingdezhen. Also discussed is Jingdezhen kiln technology. 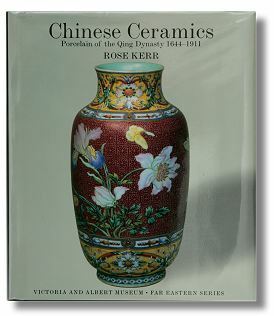 I think that when I am thinking about a good beginners book to recommend, it is not a book about cheap porcelain you can find at flea markets I am thinking of, but this book, for example, that in a modest format explains why Chinese porcelain is an exceptionally interesting art form and how come peopele are prepared to pay millions of $ for just one vase or a dish. I think that is where we should all begin, and then scale down towards what we can afford but with the goal in mind, that one day we should own at least one of these pieces. 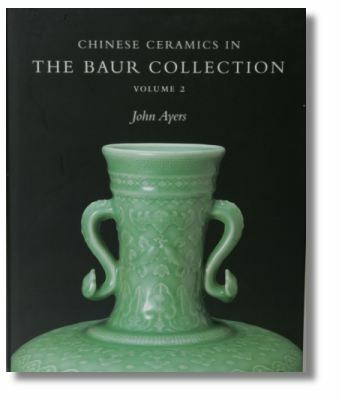 This is the most charming book that is likely ever to be published on the subject of early Chinese porcelain. 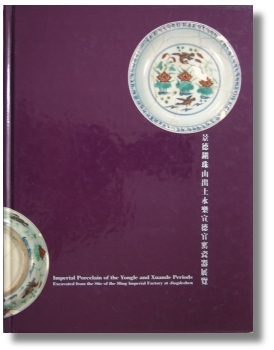 This book is a collector’s item in itself and I highly recommend it for the understanding of early Ming. 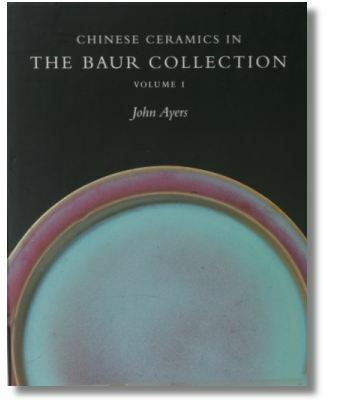 The personal enthusiasm and brilliant mind of the author goes a long way to explain why we collect Chinese porcelain in the first place. This is a good friend to have in the book shelf. Go for a first edition if you can find one, for the “ambiance”.